This is not a commercial website - it's mainly informational. There are two major wings plus a few miscellaneous pages. Cliff CanyonTM is an umbrella trademark covering content creation and production by Ken Westover. His most active excursions have been into publishing, television, radio, and music production. The Beatles released 12 albums of original material in the United Kingdom (UK). 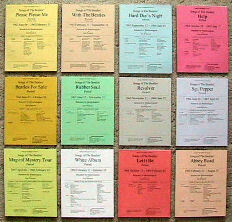 These were released on CDs in the late 1980s, and constitute the body of work produced by the Beatles the way the Beatles wanted it presented. All books are 8½″ x 11″ paperbound with index coverstock. For details on the minutia included in each volume, visit our Songs of The Beatles Overview web page. For an overview of the records released by the Beatles, visit our Beatles Overview web page. Songwriter and performer Ken Westover used the Korg 01/W keyboard synthesizer to compose demo versions of many of his songs. He documented what he learned about this versatile instrument in his Korg 01/W Percussion Manual . In addition, he created dozens of web pages to create an on-line manual for users of the 01/W. Ken has received praise for his style and contribution to the 01/W community. Recordings of Ken’s original compositions is in the process of being made web-ready and uploaded as available. His nine-song collection, Mist Romances , has been digitized and is now available for listening. The addition of images, including Karaoke-ized lyrics (lyrics appear synchronized with the soundtrack), is in-process. These “videos” will be uploaded as available. Ken’s musical background is summarized here. Copyright ©2002-2003, 2006-09, 2019 by Ken Westover at Cliff CanyonTM Publishing Co. All rights reserved. Go to: Top of this page.